However, when it comes to implementation of quality monitoring and driving results, the answer isn’t always as clear. This white paper will examine Quality Monitoring for contact centres on many levels, starting from the basic reason to monitor your calls all the way to what drives a Return on your Quality Investment. Let’s imagine for a moment that you are at a hamburger restaurant. You order your burger, pay, eat and leave satisfied as you found your burger tasty and prepared as you like it. If you were to provide feedback to the hamburger joint, you’d most likely leave good feedback. As a measure of satisfaction, this company would think that it is doing well, as all the things it measures appear to be working just fine. Flash back to moments before you ordered your burger…you are in the restroom and notice a young man walk out without washing his hands. After ordering your burger and taking that first big juicy bite, you notice that this same young man is the one who just prepared your meal. The perception of this event completely changes the resulting satisfaction that this customer had without this knowledge. This customer now most likely would provide negative feedback and most likely never dine there again. Though this employee’s hygiene habits have little to do with the assembly of the hamburger, this scenario describes why it’s important for the management of the restaurant to monitor those habits. Call centres are no different…they must balance the need to measure outcomes while also measuring the behaviours and activities that support, drive, or could potentially undermine those outcomes. Here-in lays the dilemma that faces QA managers…what and how to measure? In the early 1900’s, Harvard professors wanted to study the effect of light levels on productivity in manufacturing. Of the subjects they observed, they found no correlation between the light levels and performance, however they did note that the employees they were studying performed better as they were observed. These employees performed better simply because they were aware that someone was watching their performance! This philosophy breaks down to the rudimentary fundamentals of the human psyche…humans in general will perform at a higher level if we think someone is keeping track. This same philosophy applies to the Monitoring of your call centre agents…it is scientifically proven that they will perform at a higher level if they know you are listening to them! Listening is nice, however your agents will figure it out quickly if they know that you are merely listening and not doing anything with the information; they will use the Hawthorne Effect to their advantage! As a remedy, the agents must be provided with a strongly supported feedback mechanism that they can easily understand. Your program should be clear and to the point. The agents have limited time and bandwidth to absorb any feedback…they are busy! Your program should integrate the supervisors or managers of the agents. They usually take all their direction from their direct supervisor…they know who their boss is! Your program should have a clear definition of what you want the agents to do. They want to know what they did right and wrong…they truly want to perform well! Your program must be consistent, fair, objective and accurate in your feedback…if it isn’t the supervisors and agents will discount the findings! When Deming went to Japan to revolutionise manufacturing as we know it today, much of his focus was on making sure that the organisation looked at the entire production stream when trying to produce quality products with low failure rates at lower costs. A large part of this philosophy was ensuring that the companies spent as much time measuring inputs as they did outputs. Knowing how you did in the end was great, but being able to statistically predict how well you will do by measuring the inputs and activities that lead to the output is better. Critical Activities – What activities make or break your call centre? If you are a 911 dispatcher, being able to get the emergency group to the right home is the critical activity. Identify these critical activities and make them high focus, key measurements, and high penalty for failure at the agent level. If you fail to measure this, you might as well be the cook who doesn’t wash his hands. Core Job Functions – Identify what the base job and scope of work your agent has been hired and trained to. For a PC manufacturer, the core function of technical support requires the agent to have a working knowledge of PC’s, Operating Systems, Software and General Troubleshooting skills. Ideally, your training department has identified the skill set, training and testing required in performing this function, and you should focus on measuring and reinforcing to that standard. Issue Resolution – It is important to reinforce your agent’s success or failure to resolve the issue. If your agents can effectively be measured and managed by the previous two factors, most likely you will see success in this type of measurement. Be careful with this one though…don’t make it the driver for performance. Telling your agents that they did or did not solve the customer’s issue will not make them perform better. You need to tell them why they did or didn’t, and if they didn’t, tell them how they are supposed to solve the problem. By spending time training and reinforcing them on the activities that lead to Issue resolution, you will see this factor affected 10 fold vs. measuring this factor alone. Soft Skills and Call Handling – This area should apply to every call centre in the world. Your agents should know how to handle the call, be confident, be polite and professional to the customer and be able to manage hold, transfer and dead air as if it were second nature. While not as critical as problem resolution, call centres that do well with these skills on top of success in the previous areas see much more success. This is the polish of your process, the icing on the cake…it is what can separate you from being just a good call centre, and being a great one. Customer Relationships – Your customers want to feel like you care. They spend their hard earned money with you, and in return they want to feel important. Acknowledging the customer’s issue with empathy, using their name in the call, engaging in conversation during dead air…all these things go a long way in turning a clinical service call into a personal relationship between your company and the customer. Again, this area is more polish than substance, but these activities go a long way in producing higher Customer Satisfaction. Internal Policy and Procedure – This takes us back to the cook and the hand washing episode. Normally transparent to customers and their experience, failure to follow Internal Policy and Procedure can lead to a significant failure in the overall customer interaction and the ability of the company to adequately service the customer. By measuring these inputs to your system, you will have a greater affect on the outcome than merely measuring and feeding back the outcome itself. These are generalised areas and these would need to be customised to your specific service or product…but the devil is in the details. Return on Investment is a snazzy term thrown around by virtually everyone in the industry. Guarantees of ROI are thrown around these days more rampantly than political campaign promises. So, what is ROI and how do you realise it? Lower Call Volumes – for every call you can eliminate from happening, you don’t have to spend the money on that contact. This will require fewer agents, less management, less telephony, and less infrastructure. In an outsourced environment, this can manifest itself in direct savings if your contract is based on a per call formula. Lower Call Times – Very closely tied to Lower Call Volumes, Lower Call Time reduces cost in all the same areas…if your agents are dealing with the customers effectively and efficiently, your call time will drop and save you money. First Call Resolution – Again, tied to lower call volumes, if your agents are solving the customer’s request the first time around, those customer won’t be calling back and costing you money! Sales/Retention Effectiveness – The true measure of a company is its ability to sell its wares. In many contact centres, the effectiveness of their sales and retention agents have a significant impact on the financial status of the company. The more the agents sell, the more money the company makes! Customer Satisfaction – Of all the ROI factors, this historically has been the most difficult one to quantify. Common sense dictates that a happy customer costs less than an unhappy customer…but tying this level of satisfaction to a dollar figure has always been difficult. Happy customers remain customers, refer their friends and associates, and tend to spend more freely with your organisation, which all make you money. Unhappy customers cancel, spend less and tell their friends bad things about your company, which costs you money. Quality Monitoring is no different than any other investment. Your Quality Monitoring efforts should have a measurable effect on one or more of these above areas to be justified. The real proof of the effectiveness of a well run monitoring program is in the results. Below we outline a study conducted with a catalog sales and service organisation, which identified two measures as their key success indicators, Customer Satisfaction Scores and Closed Sales. In this pilot, the company had two separate sites which handled similar calls and performed similar functions. Initial reviews of each centre identified that the performance on both indicators was similar. The company then introduced a full BPA Monitoring program to Site A, and left Site B as the control group with no monitoring or feedback. The monitoring put into place at Site A was a comprehensive program focusing on not only the critical activities, but the objective measures required to achieve a best in class scenario for both sales and customer satisfaction. 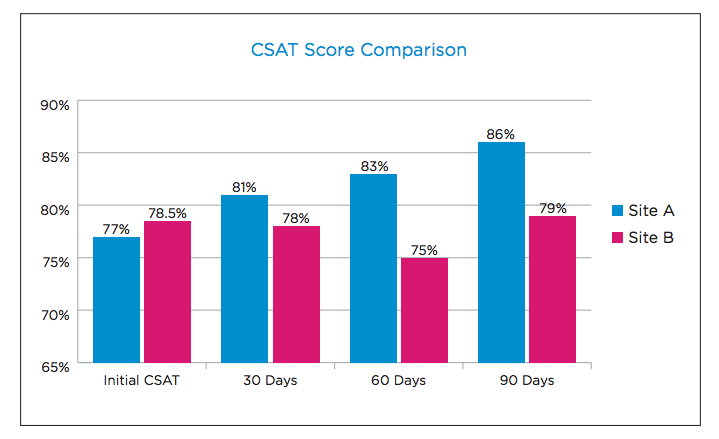 The first area we looked at was the time impact on the CSAT scoring. The results were revealing, with Site A improving by almost 10 percentage points in a 90 day period, compared to no improvement in site B. Next we looked at the program’s effectiveness on Closed Sales. Since the monitoring program had several sales specific measures included, the agents were given monitoring and feedback on how to improve the quality of their sales efforts and increase the quantity of the basic sales skills. 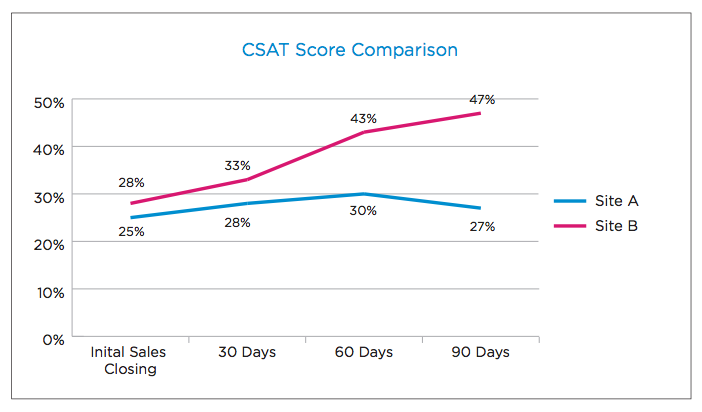 Like the CSAT chart, the results were also positive, with an improvement of almost 20 percentage points in closed sales. The conclusion from this study is clear…the implementation of an objective and clear monitoring program can and will have a quantify able impact on your customer experience. By Craig Antonucci, Director of Client Strategies, MBA and Professor of Decision Sciences.